COSTA MESA, Calif. (AP) — When Los Angeles Chargers coach Anthony Lynn says that Austin Ekeler is pound for pound the strongest player on the team, he isn’t just dealing in hyperboles. The 5-foot-10, 200-pound running back said he continues to lift four days a week during the season because it is therapeutic. Ekeler said he took it easy during Wednesday’s session because of a sore neck, lifting 295 pounds. Despite being short in stature, it is Ekeler’s strength which is a big reason why he has earned the confidence of teammates and the coaching staff. The weight room isn’t the only place where Ekeler has made his mark. He leads the league with an average of 7.5 yards from scrimmage per play. Even though Ekeler is likely to get the start, he isn’t trying to approach the game with a different mindset. “You see how low he is when he’s cutting it in and out of holes. I think sometimes you can see it from afar, but he’s just so powerful and tough to bring down. Very seldom does the first guy get him,” quarterback Philip Rivers said. Ekeler is the first undrafted back in team history to have a rushing and receiving touchdown in each of his first two years in the league. Ekeler’s 10 receptions in last week’s 45-10 win over Arizona made him the fifth running back this season to have double-digit catches in a game. “I feel like last year I had to prove something and establish a role. 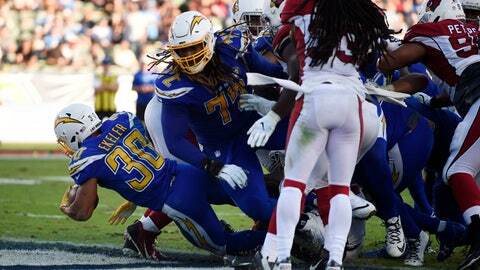 Now I’m trying to build and increase on it,” Ekeler said. The Chargers (8-3) will face a Steelers defense that is ranked sixth in the league in total defense and 10th against the run. However, the Steelers (7-3-1) have allowed 398 yards on the ground the past three games, including 124 in last week’s 24-17 loss to Denver. The Broncos’ Phillip Lindsay was the first running back in 11 games going back to last season to post a 100-yard game against the Steelers (110 yards on 14 carries). “He’s going to be in a different role in this game, but you can tell he’s a dynamic player. You can tell that in the different ways that they use him,” Steelers coach Mike Tomlin said of Ekeler.